Thirsty Soon After You Eat? Have you ever felt thirsty soon after you eat ice cream or chips? I'm sure you have! Why does it happen only when we eat certain types of food and not all? Let's find out! Eating certain types of foods drains water from your body which in turn, sends a signal to your brain to replenish the lost water. This signal is the thirst which you feel. So, what are these foods? • Salt: Salt is high in sodium. When there is an excess of sodium in the body, more water is used to dilute it. In order to do so, your body draws water from the cells. This reduces the water content in the body and makes you thirsty. • Sugar: Like sodium, simple sugars use up water in the cells to break down into simpler compounds for absorption. This in turn, results in thirst. • Diuretics: Diuretics are substances that promote urination. 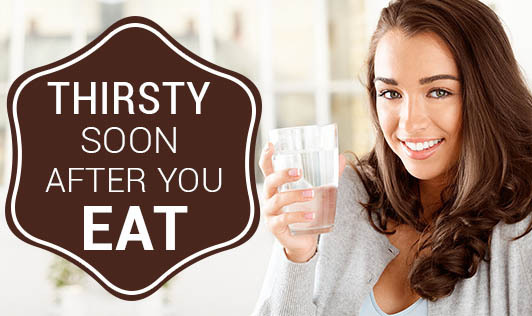 So, naturally, when you eat foods high in diuretics, your thirst also increases. Natural diuretics include caffeine, tomatoes, green tea, onion, garlic, blueberries etc. • Baked and canned food: Baked foods like bread, bun, etc have yeast and baking soda/powder which are high in sodium. Canned foods have excess salt to preserve the food product. This again is high in sodium which leeches out water from your cells. Apart from these, the physical properties of food like temperature, texture and taste also influences your water intake after food. The next time you grab water after eating, try to assess why you're thirsty. This will also help in controlling your salt and sugar intake!